The Wildflowers. - GRANADA WILDLIFE a complete wildlife experience. Where to start, there are so many beautiful, unusual and rare species in the area that I could take up pages with lists and descriptions so I will just highlight a few of the best. In the local sierra’s there are a great number of endemic species ranging from the large and showy Sierra Nevada Aquilegia (Aquilegia nevadensis) which is both beautiful and very rare, found in a few of the sierra’s surrounding Granada to the very diminutive but still equally beautiful Viola dementria which grows in rocky areas in Sierra de Loja and other ranges locally. Crocus nevadensis is a species that is also found in the sierra de Loja and more frequently in the sierra’s around Granada, it is often accompanied by the much pinker Colchicum triphyllum. 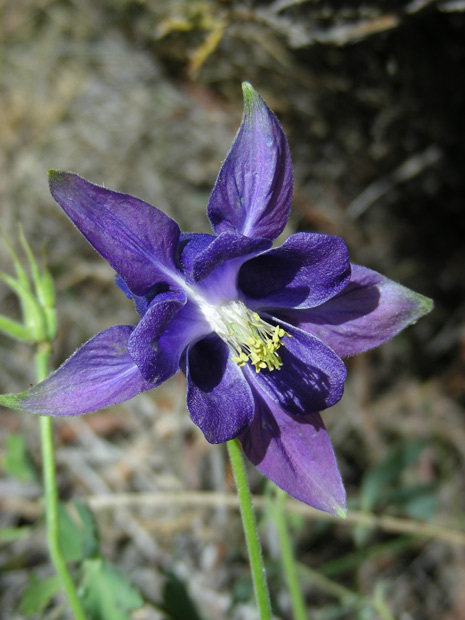 Sierra Nevada Aquilegia (Aquilegia nevadensis). The large brightly coloured wild Peonies, Paeonia broteroi and Paeonia coriacea both grow commonly in the area, Paeonia broteroi down in amongst the Oak woodlands and coriacea up at higher altitudes in the mountains. There are a great many endemic species at higher levels including Pinguicula nevadensis, Gentiana pneumonanthe subsp depressa, Gentiana sierrae, Linaria glacialis and Odontites viscosus subsp granatensis just to mention a few. Amongst these rare plants there are the commoner species which make the meadows, mountain slopes, roadside verges and wetland margins take on an ever changing beauty though out the seasons. View my Wildflower web album here. © of all Photographs and text on this web site and the blog belong to Mick Richardson and Granada Wildlife 2009/19. Número de Seguridad Social (Social security Number) 18-1056440238 and Responsabilidad Civil (Public Liability Insurance) by Ocaso.